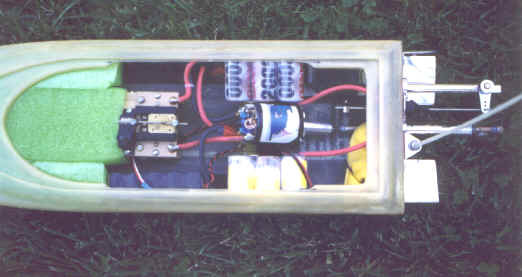 Greg’s article is the second in a series of year 2000 Set-up and How To articles being presented by Rum Runner Racing for Fast Electric R/C boating enthusiast. Greg is a Champion NAMBA racer who is known across the USA as, “The Mono Master”. Greg’s mono set-up skills are legendary. We hope this article encourages others to enjoy setting-up your own boat and join the Fast Electric Boating fun. It is easy once you know the secrets. A couple years ago I visited Sam Maus’ shop one afternoon to inspect a new plug for a little boat that now is know as the Micro Bullet. My first reaction to Sam was to comment that the boat is too small and too narrow. The first time I threw my new Micro Bullet in the water I new I had a winner. This little boat screamed and turned on a dime. I was impressed and instantly sold on this boat. So where do you get your Micro Bullet? There are several places that now sell the Micro Bullet and the entire Maus fleet. On-line, I recommend you buy direct from Maus Motorsports or from Fuller’s Fast Electric, Hyperformance Products, or Bandit Boats (links at the bottom of the article). Fuller offer’s a service in which he will set the boat up for you. Fuller also sells the motors and hardware that I use. Now that you have your boat, look it over carefully. Before you do anything, decided where your hardware, electronics, batteries and motor will be mounted. TIP ONE. The first concern is how to determine the best Center of Gravity (CG) for your boat. This is critical. I recommend that your CG in the Micro Bullet be kept towards the back. That is, toward the transom. I accomplish this by installing my motor within 3 inches of the transom. The other reason this is important is with a powerful motor you may develop a ‘torque roll-over’ problem. With a proper CG, you can use your trim tabs and eliminate this. Installing your motor mount. I make my own motor mounts out of 60/1000th aluminum. You can purchase this aluminum from your local hobby shop. However you can buy pre-made mounts from Fuller or your local hobby shop. I install my motor mount with epoxy and glue it direct to the hull. Then I use 6 oz. cloth tape with epoxy to give the contact point extra strength. Be careful to keep the centerline of your motor mount in-line with your the centerline of the strut. TIP TWO. Your hardware installation also makes a huge difference. I recommend for running hardware your choose either Fuller’s, Hughey or Hyperformance. I like to install my hardware so the strut is at least 2 inches behind the transom. This distance helps with trim and you get better performance. TIP THREE. 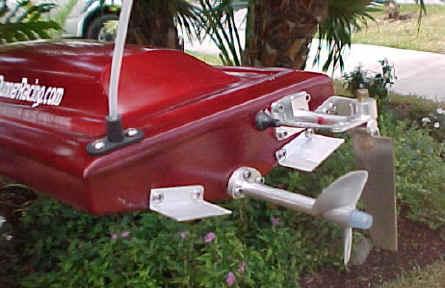 The turn fin should be mounted on the boat with a piece of angle aluminum at least 60/1000(inch) thick. I generally cutout my own fin in a teardrop shape. Make a paper pattern before you begin. Be sure your fin is long enough to extend below the bottom of the boat about 1-1/4 to 1-3/8th of an inch. The turn fin must be offset to the right side of the transom. You can also angle your turn fin. This may give you a better bite with high speed cornering. As for my rudder, I personally like the Fuller wedge rudder. I shorten my rudder by at least 1/2 inch. The Hughey medium rudder is also a good choice. Next, on your transom, measure 1-3/8th inches to the right of your boats centerline. This is where you will mount the rudder’s bracket. This will give your rudder clean water and give you an edge for oval racing. Then use a post to extend the actual rudder blade behind the boats transom so the rudder’s leading edge is even with the drive dog. SPEED CONTROLLER. In the event you are setting your boat up for N-1 or N-2 Mono I recommend the HUGHEY controller. This controller is a switch type controller and is not bothered if it gets wet. A real plus. See the below photo. I mount my Hughey Controller right in front of the Motor. With my 6 cell boats, I use saddle pack batteries and mount them on each side of the motor. To accomplish this set-up properly, you may have to grind the lip away from the hatch area so you can slip the packs in. Greg's N-1 and N-2 Setup. Ed Hughey or Ray Fuller will help you with your Controller order and set-up details in the event you need help. The Hughey requires you to construct a mount that will hold the controller and the servo, which operates it. I use the HiTec 85BB servo with most of my Hughey controllers. If you set-up for 8 cells, I recommend you use an modern ESC (electronic speed controller). There are many good ones on the market. Since I use an Aveox Motor, I can only use the Aveox controller. This controller is very sensitive water. Be sure your supplier water-proof’s the Aveox controller for you. This is an important step, which will save you a lot of headaches and money, later on. For 8 cells, I place my batteries in front of the motor, the controller on the right side and the receiver pack on the other side. Additionally, there are several new stock motors out for the 2000 season. In 6 cell Modified Motor, the field opens up even further. You can run a can motor (05 Series) or use an exotic motor such as an Aveox, Plettenberg or Lehner. Personally, I am an Aveox fan. The Aveox 1409/1.5 was the predominant winner in the 6 cell modified class at the nationals, taking 1st and 3rd places. For 8 cells, I used the Aveox 1409/1.5y model with a Tidewater 45/55 prop. It’s a fast combination with very little maintenance required. Other good power choices include the Astro 306-5 turn, Plettenberg models 920-4 turn or the 930-3 turn. The 920 series is lighter while the 930 series develops more torque. The Lehner 2725-3 turn. Having good batteries goes without saying. When ordering matched batteries, be sure you order from a reputable matcher or outlet. There are a lot of junk batteries out there being unloaded on unsuspecting hobbyist. What NAMBA racing classes does the Micro Bullet enter? The great thing about the Micro Bullet is its flexibility. One hull can race successfully in 3 different NAMBA classes. At the 1999 NAMBA Nationals, the Micro Bullet was very successful in N-1 Mono (Stock Motor on 6 cells), N-2 Mono (Modified Motor on 6 cells), and O-Mono (8 cells with any Modified Motor). 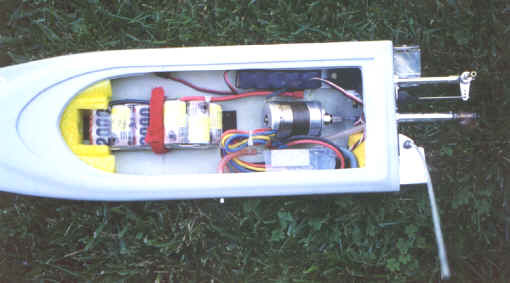 A number of known racers use one boat and switch batteries and motors which allows them to compete in two or more classes. Size: 22 inches long, 7 inches wide. Bare Hull Weight: approximately 8 oz. Running Hardware: Fuller’s Hardware Kit. Price: $90.00. Batteries: Ballistic or Fuller’s. Check for pricing and availability. 1. Ordering the Boat. We recommend ordering directly from Maus Motorsports or from Fullers Fast Electric, or Bandit Boats. 2. Running Hardware. Rum Runner recommends you contact Fuller’s Fast Electric’s. Fuller sells the complete line of Fuller and Hughey hardware. Another very reliable source is Superior Hobbies, they also represent both lines. 3. Motor recommendation’s. For 6 cell stock motors, the fastest motor’s in the USA are the ones set-up by Rob Michaels @ Superior Hobbies. Contact Rob at, racing@superiorhobbies.com . There are many choices for 6 cell modified motors. The Plettenberg line is distributed Fuller’s Fast Electric’s and Superior Hobbies. Both are great sources with reasonable prices. The Lehner line is distributed by Fuller’s. In the event you are seeking the Aveox motor and controller, Rum Runner recommends; Rogell R/C Marine or Fuller’s Fast Electric. 4. Radio and Servo’s. Rum Runner purchases our FM HiTec Radio’s and Servo’s from Superior Hobbies. Contact them directly for pricing. 5. Batteries. For racing, you will want professionally matched batteries. Rum Runner uses select batteries from Fuller’s Fast Electric, Superior Hobbies, or Fine Design Manufacturing. 6. Hughey Boats Products. Order On-Line from Fuller’s Fast Electric’s or phone Hughey Boats directly @ 317-299-3303. Greg will be at the Spring Splash Race (NAMBA) in Seattle, Washington. The race will be held on June 9, 10 and 11, 2000. Register today. Click Here. Greg invites you to join a Fast Electric R/C boating organization. Why be left out. Join in the fun. Greg is a member of NAMBA (The North American Model Boat Association). The leading worldwide organization for oval fast electric racing. This article was written exclusively for Rum Runner Racing by Greg Schweers. Use of this article is strictly prohibited without the prior written permission of Rum Runner Racing.